Well, friends, it’s that time of year again. The season where folks who love social embrace the barrage of best-of lists, and whittle away the calendar year tucked into YouTube and Tumblr blogs, among other sources of curated re-capperie. Chances are, your social media strategy is set to “schedule” while you manage instead a different kind of social—the one involving a deluge of imbibements, secret gift-getting and a get-together or two. No matter what you’re up to this season, holiday ambiance is essential to good times. Based on our extensive research* we’ve concluded everything is approximately 20% better with a cute holiday owl set in front of a fire. *Results concluded based on data gathered in an informal, unscientific poll of Hootsuite marketers who love owls and good times. Birds are enjoyable for many reasons. Turkeys, for example are delicious, but labor intensive. Cute holiday owls on the other hand? Not edible, but hassle-free. If experience has taught me anything, decorating a tree is not as easy as it looks. In my family there’s usually an epic battle over which child’s nostalgic homemade ornament gets prime front-and-center placement (mine, obviously). But put on the holiday owl and no one will look at the tree anyways; this guy is just so darn cute. Now you know that the answer to “I got 99 problems but _________ ain’t one” is “Cute Holiday Owl”. Or whatever seasonal holiday you choose to celebrate. If you don’t already have an adorable owl and crackling fire, then your celebration will be all the better with this cute holiday accompaniment. Last year, you gave away your heart. This year, to save you from tears, we’re giving you something special. Watching this video, one can’t help but want their very own owl. Well, friends, this year Hootsuite makes it possible. You can pre-order your very own plush Owly (available for delivery in the new year) with all proceeds going to O.W.L (orphaned wildlife) Rehabilitation Society. Get yours today. 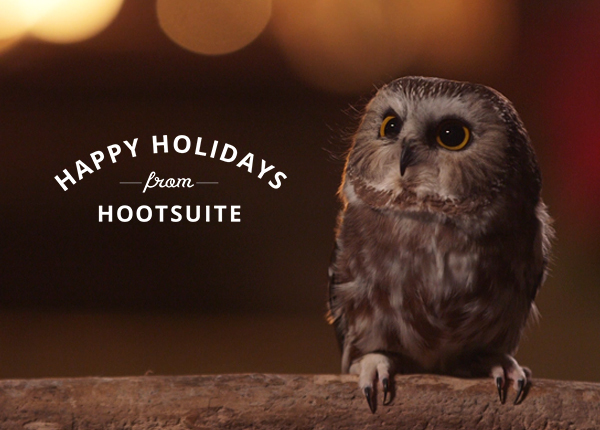 Go ahead, turn it on, turn it up, and enjoy a happy holiday owl from your friends at Hootsuite.